The country club “Denisov Myis” is located in the pine-tree forest on the shore of one of the most beautiful lakes of Karelia – Lake Syamozero. It is just 60 km away from Petrozavodsk, the capital of the Karelian Republic, and 50 km away from the airport. The distance from the main road (1 km) makes it possible that there is always fresh air and silence in our country club..
“Denisov Myis” is remarkable for its quiet and domestic atmosphere; it is always ready to welcome new quests because it works all year round. Friendly staff will provide you with the high level of service, what is one of the competitive advantages of the country club. “Denisov Myis” creates all conditions for comfortable and cosy accommodation in rooms and cottages. The cottages are equipped with fireplaces, satellite television, inner telephones, microwave ovens and refrigerators. Also there are all needed facilities such as bathrooms and toilets in the cottages. We offer you tasteful and different kinds of food in our restaurant. The menu consists of the meals from the Russian and Karelian cuisines. We have special meals for children and vegetarians as well. The service of take away food and beverages is available for our guests. There is a great variety of additional services in our country club. Our guests can order various excursions (to Kizhi island, Valaam island, Ruskeala mining park, Kivach waterfalls and etc. ); ride a horse; drive a quad bike, a snow mobile or a crossover; have a water trip on a high-speed motor boat or an air cushion; drive a catamaran or a paddle boat; ski and slide on a snow plate from the ice hill; drive a bicycle; have an organized game of paintball or laser tag; visit the Russian steam sauna with a broom; and enjoy the game of table tennis and billiard. . Vivid place that seems to have been created by Nature specially to rest in Karelia. The country club “Denisov Myis” is located 67 kilometers far from Petrozavodsk, the capital of the Republic of Karelia. It is a narrow piece of land hugged by the waters of Syamozero, one of the richest in fish lakes of Karelia, by two sides. Pine forest and original landscape, birds singing and waves sounding, cozy wooden cottages and guest houses of Karelia equipped with fireplaces and patios – this is what real Karelia, clean and friendly, is about. 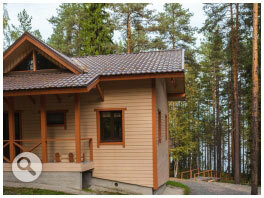 Rent cottages or the whole tourist center in Karelia with the help of our managers. 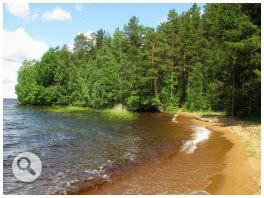 Relax in Karelia: in winter, spring, summer and autumn. 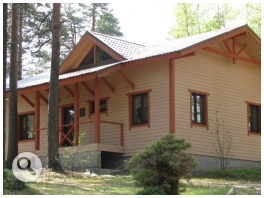 Rest in Karelia in comfortable cottages in the country club “Denisov Myis”. When some people are going to have a long-expected vacation they do not hesitate where to go. Why is that? Everything is decided beforehand: it is Karelia – a blessed and amazing with its beauty place – should become haven for those tired from all the fuss and smog of big cities. Indeed, what can be better than renting a cottage in Karelia, among virginly clear forests, deep transparent lakes and beautiful rivers? It is a great place to get rid of stress, to place your thoughts in order and enjoy the serenity of Mother-Nature. 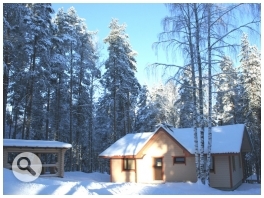 Moreover guest houses in Karelia are ready for people from Russia and all over the world all year around. 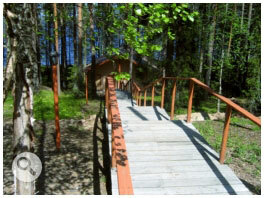 If your long-standing dream is to visit Karelia, the guest house “Denisov Myis” will be glad to present you its services. The area of the country club in Karelia is a beautiful place in cone forest near the lake of Syamozero and is located 67 kilometers from the capital of Petrozavodsk. Clean air, songs of birds, loads of green and rough scent of pine needle, the whisper of waves, and wooden houses equipped with all needed – all these is Karelia and the country club “Denisov Myis”. And anyone can enjoy all these – a just married or an old couple, a company of friends… We will be happy to meet everyone! No doubt, any rest should be comfortable. 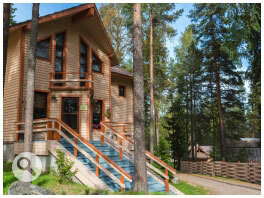 “Denisov Myis” is not just a place of magical beauty but also the best accommodation in Karelia. Traditionally houses in Karelia are made of wood and we didn’t ruin the tradition so all our cottages are made out of eco-friendly materials and are named “Elka” (“Fir-tree”), “Berezki” (“Birches”), “Klyukva” (“Cranberry”), “Moroshka” (“Cloudberry”), “Tri medvedya” (“Three bears”), “Dom ryibaka” (“The fishman’s cabin”) and “Dom Gushina” (“The Gushin’s cabin”). 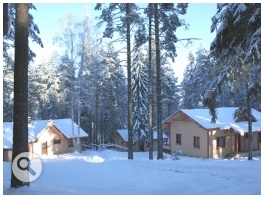 The country club “Denisov Myis” takes care about the comfortability of its quests, quarantining cozy rest in Karelia; the cottages are equipped with all the facilities such as bathrooms, toilets, beds with orthopedic mattresses, clothes horses, fireplaces, camp cots and entresols, DVD-televisions. It will be easy and nice to sleep, read a favorite book, watch interesting programmes in such a cottage. There are also 4 double-bed hotel rooms located on the second floor of the hotel-restaurant complex. What kinds of entertainment can we provide you with at the country club “Denisov Myis”? Of course, first of all, it’s fishing because the lake of Syamozero is rich in fish. There are pikeperch, bream, white-fish, grayling, luce, dace, ide and other kinds of fishes here. That is why fishmen often rent cottages in Karelia. You can go wishing with a spinning and mayflies on a motor boat for a decent price. Those who prefer active rest will like the area for paintball where competitions between two teams can be held. Those who love Nature can go to the forest to collect mushrooms or berries. Those who really want to relax can do that in Russian sauna with wooden steam-room that is located in 30 meters from the shore of the lake. Also we have a riffle range, a pool, tennis and board games for our guests – there will be no chance to get bored here! Skiing on interesting and twisted paths, playing hockey on the lake’s ice, races on snowmobiles – these and a lot of others entertainments are offered from December to February by our country club; Karelia is not less gorgeous in winter than in summer that’s why every walk to the forest or towards Syamozero will give you a lot of joy. Children will be happy to slide over the ice-hill on sledges. “Denisov Myis” is the place where you will eager to return. 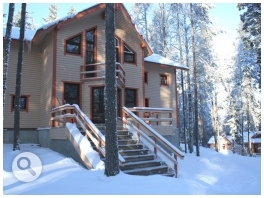 Our comfortable country club and Karelia are waiting for your arrival! Rest on the lake: in winter, spring, summerand autumn. При наличии свободных мест, на Вашу электронную почту отправляется письмо с подтверждением бронирования и счет на предоплату 30% от общей стоимости проживания, который можно распечатать и оплатить в любом банке Вашего города, оставшуюся сумму необходимо вносить в день приезда. При отсутствии свободных мест Вам предложат варианты бронирования на свободные коттеджи (номера) или свободные даты. Только при оплате счета на предоплату средства размещения считаются забронированными. Счет действует в течении 5 рабочих дней.